For all you Bird Watchers out there. Here's one to make you wonder a little bit. I first noticed this bird in the Grimsby, Ontario area in October 2000. 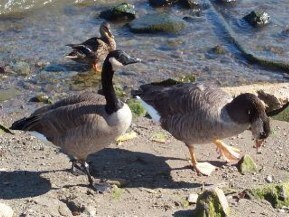 It is part of a group of Canada Geese hanging around this area and seems to do everything a Canada Goose does. Consultation with birders in this area concluded it to be a cross between a Canada Goose and something else, but we were undecided as to the other part. Any Ideas? 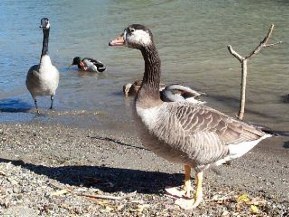 Awdgoose resided in Grimsby until July 2002. - at the end of July Awdgoose disappeared and I have not seen it since. It's whereabouts or it's fate is unkown at this time. Awdgoose is back - spotted Awdgoose this afternoon at the mouth of the 40 Creek here in Grimsby - First time in over 3 months. Awdgoose is live and well and still spends most of it's time here in Grimsby. Awdgoose still live and well. I thought Geese were monogamous - but this guy had 2 lady friends last summer. There were some young in the summer of 2005 - but all looked like typical Canada Geese. Awdgoose still live and well and still residing at the mouth of the 40 Creek here in Grimsby. As an added attraction this year we have a Barnacle Goose who shows up occasionally. It was here today (Dec 27, 2009) and was also seen here last winter on and around Feb. 2, 2009. Awdgoose was here until the spring of 2012. He has not been seen since. Fate or whereabouts unknown. This will be the final report - unless of course he shows up again.